American singer Whitney Houston performing on Good Morning America (Central Park, New York City) on September 1, 2009. Whitney Houston was an American singer, actress and producer. She released 6 studio albums, 3 soundtrack albums and 1 Christmas album. She has sold more than 200 million records worldwide, thus being one of the best-selling artists of all time. She is also the most awarded female artist of all time. Her debut album is the best-selling debut album of all time by a female artist, while the single "I Will Always Love You" is the best-selling single of all time by a female artist. "The Bodyguard" soundtrack is the third best selling album of all time. She is regarded as the best voice in the history of pop music. 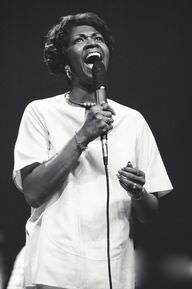 Her mother was Cissy Houston and her cousin was Dionne Warwick. She was married to Bobby Brown from 1992 to 2007. Her daughter is Bobbi Kristina Brown. The cause of her death was drowning and the "effects of atherosclerotic heart disease and cocaine use". During her career, she won 7 Grammy Awards, 31 Billboard Awards, 22 American Music Awards, 1 Emmy Award and 6 World Music Awards. American singer Whitney Houston performing "My Love Is Your Love" with her daughter Bobbi Kristina Brown on Good Morning America (Central Park, New York City) on September 1, 2009. Whitney Houston was a famous American singer, actress and producer, who was born on August 9, 1963. As a person born on this date, Whitney Houston is listed in our database as the 2nd most popular celebrity for the day (August 9) and the 6th most popular for the year (1963). People born on August 9 fall under the Zodiac sign of Leo, the Lion. Whitney Houston is the 33rd most popular Leo. Aside from information specific to Whitney Houston's birthday, Whitney Houston is the 212th most famous American and ranks 47th in famous people born in Newark, New Jersey, U.S. In general, Whitney Houston ranks as the 353rd most popular famous person, and the 44th most popular singer of all time. “The Famous Birthdays” catalogs over 25,000 famous people, everyone from actors to singers to scientists to serial killers and more. If you're curious to see who was born on your birthday, you can use our database to find out who, what, where, when and why. You can search by birthday, birthplace, claim to fame or any other information by typing in the search box, or simply browse our site by selecting the month, the day, the horoscope, or any other clickable option. 47th born in Newark, New Jersey, U.S.